With cold weather rapidly approaching, forward planning is essential to ensure drivers can get to their destination safely. With Sweden being famous for its cold climate and harsh winters, Volvo is in an ideal position to draw from its extreme testing and homeland experience to ensure its customers in the UK are prepared to face what Mother Nature has in store for them. 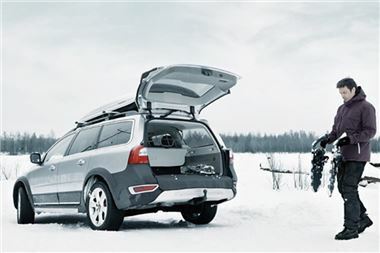 Volvo Car UK has launched its 2011/2012 Winter Programme - a complete offering to help drivers face the upcoming months in complete confidence. Along with its Winter Tyre and Winter Safety Inspection, Volvo has recently announced that its XC60 and XC70 are now available as a D3 with All-Wheel-Drive and the V60 can now be ordered with AWD giving those drivers who do not want an SUV the ability to still specify four wheel drive. The V60 D5 AWD (215hp), XC60 D3 AWD (163hp), XC70 D3 AWD (163hp) are available from £34,020, £29,100 and £30,615 respectively and can be ordered now. All three models are also available in Volvo Ocean Race specification for those who want individualism and luxury with all-wheel-drive handling. In 2010, demand for winter tyres far outweighed supply, with ranges being completely sold out within six weeks and some sizes even being sold out within the first two weeks. To ensure dealers can offer drivers the benefit of using winter tyres, Volvo has increased its stock level to hold a minimum of 10,000 tyres, over four times its stock of last year. "The time is right for drivers to start thinking about changing from their standard tyres to winter tyres. As we've experienced over the last few years, there is strong demand for these tyres and it is growing every year" says Lee Berrell, Aftersales Manager for Volvo Car UK. Drivers have the option of ordering alloy wheel and premium tyre packages, a set of four premium tyres or individual premium tyres. Volvo offer 16", 17" or 18" tyres and packages, dependant on model and existing wheels fitted to the vehicle. Available from £495 (plus £85 fitting) for four tyres and £1100 (plus fitting) for alloy wheels and tyre packages, it offer customers excellent value and peace of mind. Whilst most two-wheel-drive owners see the benefit of winter tyres, XC owners with all-wheel-drive are being urged not to ignore the benefit of winter tyres during cold conditions. When braking, there is no substitute for having the right tyres. Alloy wheel and winter tyre packages for the XC range start from £1,200 (plus £85 fitting). For those customers short on space or not wanting to store their own additional tyres, Volvo Retailers will store the customer's other set of alloys/tyres for an additional £85 every six months. With alloy wheel choice being an important part of a customer's decision process, Volvo has launched a new iPhone App (available free from iTunes) to allow customers to see what their vehicle would look like with replacement alloy wheels. With this App, customers are able to view what their own specific vehicle would look like by simply taking a picture of the vehicle and the app will replace the wheels with a chosen design. This will allow customers to choose the correct alloy wheel/winter tyre combination to suite their taste. Helping to make sure customers are fully prepared for the cold climate, along with the offer of winter tyres, Volvo has introduced a free-of-charge inspection that includes a 30 point check. The inspection ranges from fluid checks to security checks on major and integral parts of the vehicle. Carried out by fully trained Volvo technicians, it will ensure the customer's car is running at its optimum level.